Born in Bloomington. Rooted in Italy. 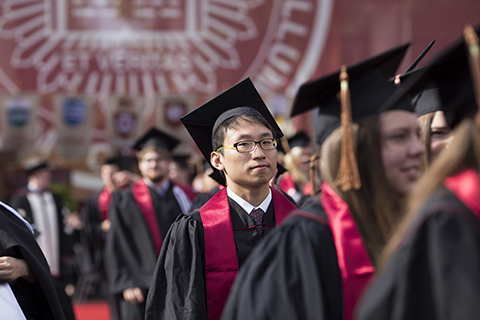 Indiana University will host Spring Commencement on Friday May 3rd and Saturday, May 4th, 2019. Undergraduate degrees will be conferred on Saturday May 4th, 2019 at 10 a.m. in Memorial Stadium, 1001 E. 17th Street, in Bloomington, Indiana. The ceremony lasts approximately 1 1/2 hours, and you should allow an additional 30 minutes for travel time from the stadium to downtown Bloomington. The event goes on, rain or shine. When choosing your reservation time, please allow time for pictures and travel as we have limited flexibility to change the time of your reservation. A deposit of $200 which secures your reservation. You may cancel your reservation and receive a full refund of your deposit by contacting us via phone by April 15th. Your deposit will be credited to your final bill on the date of your visit. Make your reservation by calling us at (812) 323-0303. The menu for graduation weekend will be a limited, prix fixe menu and will include soup or salad, and choice of entree for $60 per person. A children’s menu, for those 12 years of age and under, will also be available priced at $15 per person. To enhance your dining experience, a full complement of appetizers and desserts will also be available, along with beer, wine and cocktail selections from our bar. Please note, that our maximum party size for the weekend is sixteen guests, and if your group is larger than eight, you will be seated at separate but adjacent tables. Each reservation seating is limited to 90 minutes. Please note: Party size is limited to 16 people. Reservation times cannot be changed and seatings are limited to 90 minutes. Reservations will be held for 15 minutes after which, we will be unable to seat you. Due to the nature of the event, we cannot provide menu substitutions. The final menu is subject to change and item availability. You have until the end-of-business April 15th to cancel your reservation and receive a full refund of your deposit. After April 15th, your reservation and deposit are non-cancellable. Your graduation deposit will be credited to your final bill at the conclusion of your meal. Indiana sales tax, Monroe County food and beverage tax, and a 20% gratuity will be automatically applied to your check. Due to the nature of the event, we cannot provide separate checks or refund deposits to specific credit cards. If you have questions about these policies, please contact the restaurant at (812) 323-0303. Born in Bloomington; Rooted in Italy Steps off of the historic courthouse square, our outpost on West 6th Street brings Italian flavors to life. A tradition since 1999, Grazie! Italiano is a fun, casual Bloomington restaurant where food is made fresh, using locally-sourced ingredients and authentic Italian cooking methods. Grazie Italiano, 2019. All Rights Reserved.